Skiing in Redruth? 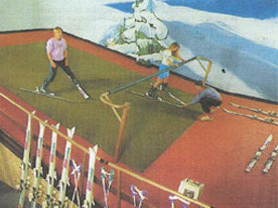 Yes you can in our Indoor Ski Centre! Learn to ski or brush up on your knowledge prior to your winter holiday. It is an amazing experience. To book please ring Tel: 01209 211059. Come and sample our unique ski teaching facility. It will give you the perfect grounding before you head off on your winter holiday, for complete beginners it will provide you with the confidence and technique to maximise your time away on the piste, and for the seasoned skiier you will benefit from the expert tuition we provide, as well as an incredible workout hitting the precise muscle groups you need to be stimulating before you travel. We provide an unrivalled level of tuition, where our instructors are right there with you throughout your lesson helping you overcome any apprehension or reservations you may have about trying skiing for the first time. An excellent venue for schools to prepare for their trips, without the long journeys out of the county to tend with. 1 hour for groups of up to 4 people (minmum 3) is £15.00 each person. 1 hour an all inclusive family rate is £45. 1 hour private lesson (2 people only) is £38. 1 hour private lesson (1 to 1) is £32. For school bookings, please call, prices from only £40.00 per hour. Prices include skis and boots. Feel free to bring your own boots if you wish. For that extra treat, why not choose us for your party venue, a birthday party with a difference, if you’re bored with indoor play areas give your children a party they’ll not forget. Prices from £8.00 pp for an hours entertainment on our machine,including party food afterwards. Please contact us for full details.